Home / Chronic Pain / Pain is No Excuse. Healthy natural sleep is possible despite chronic pain, fibromyalgia, osteoarthritis, rheumatoid arthritis, back pain, neuropathy, and headaches. I don’t want to offend you. But, I probably will. Here’s the part where some of you are going to get offended and want to leave a strongly worded comment. To put it mildly, the belief that you can’t sleep because you have some kind of chronic pain is a bunch of nonsense! 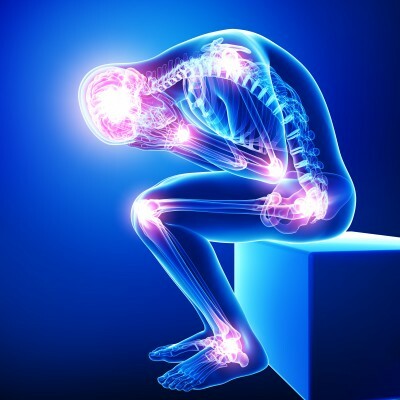 In my experience, an overwhelming majority of people with chronic pain conditions like fibromyalgia, osteoarthritis, rheumatoid arthritis, back pain, neuropathy, headaches, and other pain problems can achieve healthy natural sleep DESPITE their pain. Now don’t get me wrong. Yes. There is a vicious cycle where pain causes poor sleep and then poor sleep leads to greater pain. I see that cycle all the time and it is real. What I’m saying is that there’s a good chance you can break that cycle and sleep radically better without more pain or sleep medication. Let me explain why this is possible. There are two primary ways that pain and sleep interact with each other. Intense Pain Interferes with Sleep: In this first way, pain at bedtime or during the night is so intense that it literally prevents you from falling asleep, interrupts or awakens you from quality sleep, or prevents you from returning to sleep after awakening during the night. Poor Sleep Amplifies Awareness of Pain: In the second way, pain is less intense and, rather than causing an inability to sleep or interrupting sleep, mild to moderate pain is noticed throughout the night because you’re sleeping so poorly. In one situation, pain is so intense that it literally disrupts or prevents sleep. In the other (more common) situation, poor sleep makes even mild or moderate pain problematic if not overwhelming during the night. If you’re in the first situation, then you’ll have to work with your healthcare providers to better manage your pain. If you’re in the second situation, then you can probably take steps toward better sleep despite pain and be sleeping radically better within a couple of weeks. This is true even when insomnia is caused by pain. Sleep transformation training for insomnia helps people to fall asleep easier, spend less time awake through the night, and simply have better quality sleep even when poor sleep is caused by pain. In some cases, participation in sleep transformation training not only leads to improved sleep, but also less pain. On top of that, 30% of people with pain who participated in a study of sleep transformation training started sleeping well enough that they chose to stop using sleep medication. If you consistently follow the sleep transformation strategies and techniques we teach at the insomnia clinic, you will be able to strengthen your natural sleep system, break down obstacles to healthy natural sleep, and learn how to take control of insomnia. How exactly is this done? I’m happy to show you. The best way to get started is by downloading the free special edition of my book. Just click the download button next to the picture of my book on this page. Now that you’ve heard my spiel, I want to know what you think. Does this sound like a bunch of nonsense? Does this sound right to you? Let me know. Leave a comment. Really. I personally read and respond to all comments here. Well, Doc, you haven’t offended me yet and you’ve even given me hope. I’m one of those people whose pain wakes them up in the middle of the night and it’s very difficult or even impossible (especially if it’s after 3:30 am) to get back to sleep. You’d think getting up so early I’d be sleepy early in the evening and I am but when I get to bed suddenly I’m wide awake. Then I get up (as you’ve suggested) go into the living room and start watching TV just to relax and before I know it I’m asleep on the sofa which is bad for my back. Then I wake up anywhere from 1:30 am to 3:30 am–in pain or in a hot flash/night sweat, and it starts all over again. I’m now setting a timer when I sit down to watch TV so that I will wake up in 15 or 20 minutes, in time to go to bed and get a real night’s sleep in bed where I should sleep because it’s a good mattress. I’ll let you know what happens. Hi Lucky. Thanks for the comment. Sounds like you’re trying to do all the right things. I’ll look forward to hearing how it goes for you.